Except otherwise noted, all of the commands in this tutorial should be run as a non-root user with sudo privileges. To learn how to create users and grant them sudo privileges, check out Initial Server Setup with Debian 8. Installation packages for Munin are available in the Debian repository, so it can be installed using the distribution's package manager. In this step, you'll install the Munin master package from the stable branch. The version in the Debian repository, Munin 2.0.25, is the same as the latest stable release. The Munin master's main configuration file munin.conf and other files required for it to function can be found in the /etc/munin directory and its sub-directories. The configuration file is made up of at least two sections — a global and at least one host section. Optionally, there can be a group section. Host and group sections start with their respective names in square brackets. This file contains variable definitions, directives that govern how Munin monitors servers and services, and which servers to monitor. In this step, we'll show how to add a node to the Munin master. This involves modifying the Munin master's configuration file to specify a host tree for the node, installing the Munin node package on the node, and modifying its configuration file so that it can be monitored by the Munin master. Let's start with the Munin node — the other Debian 8 Droplet you created. 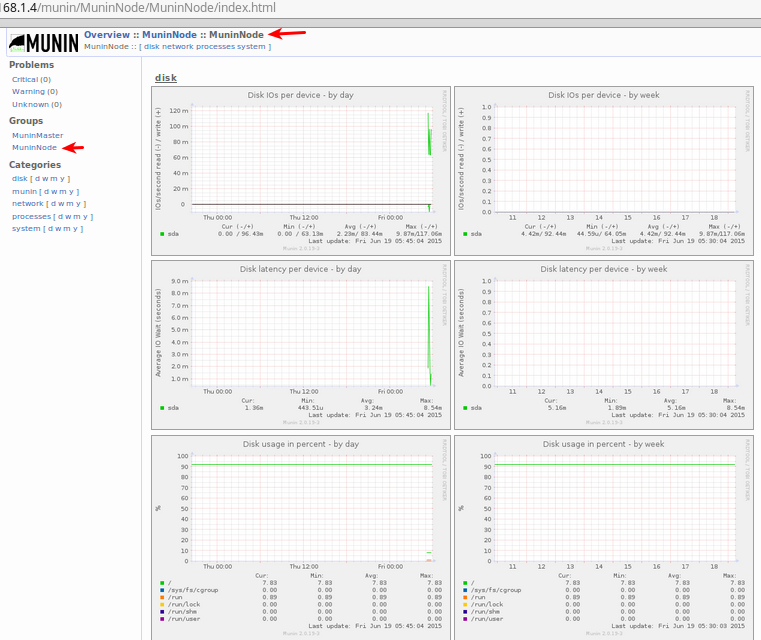 Munin checks for new nodes every 5 minutes. Wait a few minutes, then reload the Munin master's web interface. You should see an entry for the node. If you don't see it yet, try again in 5 minutes. Using this method, you may add as many nodes as you have to monitor.